Disclosure: This post is sponsored by Participant Media. All opinions expressed are 100% my own. I consider myself a lifelong learner. I’m not in school anymore, but that doesn’t mean I’m not reading or trying to keep on the latest developments in the subjects that interest me. I think my love for learning started at a very young age. I was an extremely shy little girl and very sensitive. My kindergarten teacher even remarked on my report card that “Stacie cries very easily”. That hasn’t changed much in 31 years! I credit my teachers for helping me to come out of my shell and for influencing my thirst of knowledge. When I look back at my school days, there’s a few teachers that really stand out and some who even inspired me to be the person I am today. Mrs. Stoneman was my grade one teacher who was so kind and went above and beyond her duties to help me try and fit in. I moved to Mrs. Stoneman’s class in the middle of the year and being the shy kid that I was, I was really struggling to fit in. I remember Mrs. Stoneman coming over to our house for a visit one afternoon. She brought with her lots of books since she knew I loved to read. That made me feel really special and more comfortable in my new class. Her visit was on her own time and definitely something that most teachers don’t do. I think that elevates her to a whole new level of a dedicated teacher who really cares about her students’ well-being. Then there was Mrs. Metzger, my grade three teacher. I loved our music classes where Mrs. Metzger would play the classroom piano and we’d sing along from our music books. Mr. Pool was my grade four teacher. He used to take an hour or so once a week and read the class stories. I remember a few of them being stories from the Bible. That’s where I first heard the story of Joseph and the Amazing Technicolour Dreamcoat. The picture below is my grade four class. 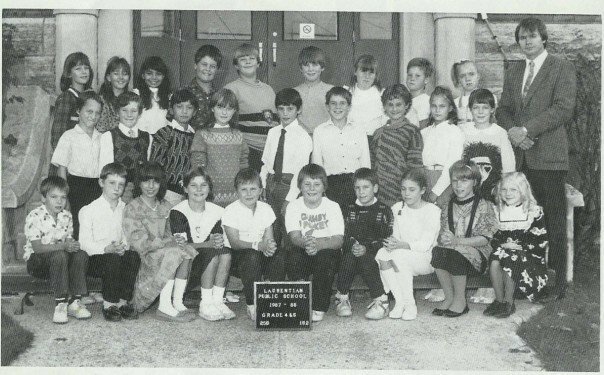 See the kid with the short brown hair in the middle row standing next to the teacher? That’s me. Notice the crazy shirt? Yep, it was the 80s. Mrs. Stoneman, Mrs. Metzger and Mr. Pool are three examples of teachers who have had a positive impact on my life. There’s many more teachers I could talk about, but this post would be way too long to mention them all! I think many of us have all had a teacher who made a difference in our lives. Whether that teacher inspired you, changed you, scared you or gave you a new perspective, they’ve all served a purpose in helping us grow, learn, change and become who we are today. If you have kids in school or have had a teacher who impacted your life, I encourage you to watch Davis Guggenheim’s documentary, TEACH, about education in America. He asks this very important question: What Does It Take to Be A Great Teacher Today? The TEACH air date is on September 6th at 8pm ET on CBS and September 18th at 8pm ET on Pivot. The documentary follows four teachers from different schools across the USA over the course of a school year. 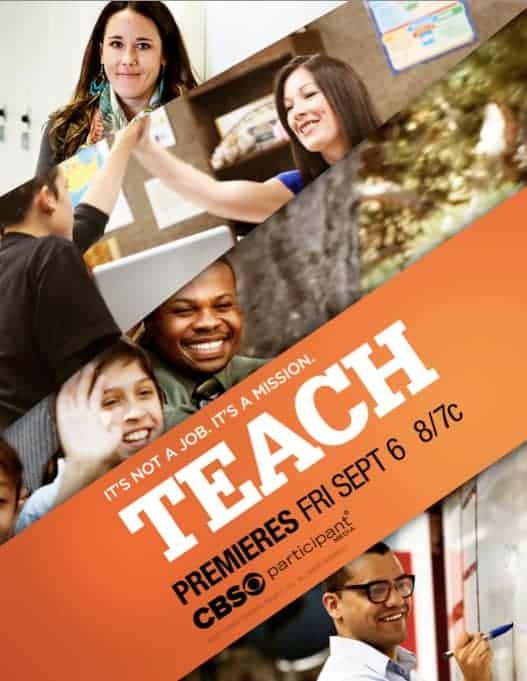 It shows viewers a unique perspective into the challenges, demands and rewards of teaching and learn how for many teachers, teaching is not only a job, but also a mission. Check out the trailer of TEACH! Looks intense right? I’m interested in seeing how these teachers motivate and inspire students and how they handle obstacles in their path. I have a great respect for teachers. They always have to be learning, adapting and innovating. I’d imagine it would be an extremely rewarding career to know that you made a positive impact on so many people’s lives. Did you have a teacher who inspired you or help you become the person you are today? My favorite teacher and Grade was the 3rd as well. While elementary is all a blur, I remember her reading to us – paddington bear and pippi longstocking. She was a gentle, genuine and caring lady, I’ll always remember her. Great post!!! I had a couple teachers along the way that really helped me out and even now if they see me on the street they remember me. A teacher that inspires makes all the difference! I had a very special teacher in the 4th Grade and her name was Mrs. Rosemary. She was the nicest teacher I ever had and she helped me with my reading and got me to go to the library and have a life long love of reading and books. To this day I love to learn because she taught me how exciting it is to read a book. She also was a great and caring teacher who helped her student’s in any way she could! I think – and hope – we’ve all had those amazing teachers that inspire us and make us want to do well. We believe we can and want to try. The teacher can really make or break a school year, and it’s sad that there are so many out there that don’t want to teach or don’t care. That’s what is very important – caring. Good teachers want kids to have fun and learn. They want to watch them grow and do well. They care that the children’ are understanding the material and try to help them when they struggle. I think it is very important to have good caring teachers for our kids. If they dont like their teacher they cant learn as well in school. I have had my son flunk a year because of this. I personally had some teachers I really like but none that inspired me . I did have one tell me something , I remember it to this day but it still doesnt make sense to me what she meant by it. We need teacher that care about the kids learning not just a paycheck. I still talk to my kindergarten and grade 1 teacher! she is my favourite. she always stayed with me after school until my parents came to pick me up .. even when i was no longer in her class. she has my picture posted on her bulletin board in front of her desk! I can remember several fabulous teachers that really touched my life. Definitely worth watching and thank you so much for sharing Stacie …. Love the childhood pic!!! I had a few teachers that were special too. In grade six our teacher had a student of the month, we all voted for who we thought it should be and he bought that person a gift, such as a jigsaw puzzle or anything else they wanted out of his own pocket. Very nice of him. And our grade seven teacher had a bbq at his house for all of us. Sounds like a good Doc.I too had a teacher that turned my life around.This will be a good one to watch. I have a lot of teachers that really inspired me. I really loved my Art teacher in High School and my English teacher in the 7th grade. This sounds like a great documentary. I also had a few special teachers and they were in grades 5 and 6. They spent more time with the students and seemed to care more about them as well as doing extra curricular activities with them. I shall have to watch this documentary. I do not know how many teachers I had over all the years in school, but there are 3 that stand out as having encouraged and inspired me. I can remember two teachers that inspired me to do better, to think more highly of myself therefore I strived to succeed. We hear much about the bad teachers with thankfully are just a few but hear so little about the good ones. Many teachers influenced me over the years. Mrs. Doyle, my first grade teacher, was particularly memorable, as was Mr. B, my French IV teacher in high school. He died about two years ago and I was shocked to find that he was only about 5 years older than our class! I had this one teacher in grade 8 that changed my life. Miss Baney, she showed interest in me and I thrived for that moment on. I was failing, but after that year I had more confidence in myself and went on to get my degree in Business. I wish I could see her again. I recently retired after 30 years of teaching. It was the best AND the worst job I have ever had. Teaching is challenging, exhausting, exhilarating, frustrating, and rewarding. I hope that I inspired a few students along the way!